The effective ingredients contained in this product can penetrate into points in the thenar and can discharge the dampness and toxins in the body through the bottom of the feet, and can soothe tension, improve sleep, skin quality and health. According to Chinese Medicine Theory, the feet have been regarded as the Second Heart of the human body. The thenar is the epitome of health of the human body. There are sixty six reflex zones of points totally on the feet. The feet is the densest part of point, main and collateral channels. It is the converged part of the artery and vein, so the microcirculation and lymphatic systems are very active. If it is to discharge toxins through the reflex zone of points, it can effectively adjust the functions of viscera that are relatively connected with the points, and prevent and treat the various symptoms of diseases prevented by the deposit of toxins in the body and also can promote blood circulation. The effective ingredients contained in this product can penetrate into points in the thenar and can discharge the dampness and toxins in the body through the bottom of the feet, and can soothe tension, improve sleep, skin quality and health. Natural bamboo extract powder, natural mineral fine powder, loquat leaves, tourmaline, trace elements, chitin, Vitamin C, Vitamin E, Orange Essence Oil, etc. Discharge toxins and nourish appearance, purify body and beautify skin, promote metabolism, enhance immune function, improve the discomfort of subhealth. Promote blood circulation, eliminate impurity in body. Constipation, abdominal distension, bad breath, foot odor, body odor, fatigue, insomnia, stress. 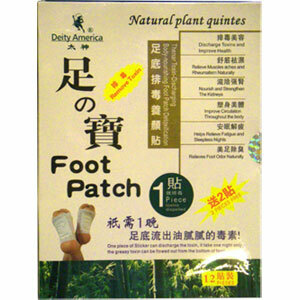 Before going to bed, please clean the bottom of the feet where patch is to be applied. Take One (1) piece of the non-textile adhesive plaster and tear off the protective paper from the adhesive plaster. Tear out the plastic bag along the outer edge and take out the sticker pack enclosed and adhere it to the center of the adhesive plaster. Apply it to the bottom of the foot and keep it on for 6-8 hours. After getting up the next morning and rub the part of thenar where the sticker pack has been stuck to. Continue this process each night for 7 days as one stage. 21 days equals one cycle. After the bamboo extract powder has been stuck to the thenar points and dense part of the channels, the powder will absorb out the waste grease and liquid, etc. toxins form the body and become greasy and sticky, which will turn the sticker pack from white to black-brown. This is the toxin in the body that has been discharged. The darkness of the used patch will depend on the amount of toxin being discharged according to the quantity of toxins in the body. Before using the product, please carefully read the instructions for use. The product is used for healthcare and applied externally only. Not to be used instead of proper medicine. Do not use on babies, pregnant women and those whose skin has an allergic reaction to the product. Do not apply to open wounds on the skin. If you feel any discomfort to your skin when applying the plaster, stop use immediately. Use as soon as possible after being opened and keep the sticker pack dry, away from moisture. Keep out of reach of children. It is best to avoid walking after the plaster has been applied.